Students, faculty and staff at the University of Maine at Presque Isle and Northern Maine Community College are participating in a “food fight” like no other in honor of Hunger Action Month. The institutions challenged each other to their 1st Annual Food Fight—a food drive being held between Sept. 19 and Oct. 3—to help stock the shelves at local food pantries. 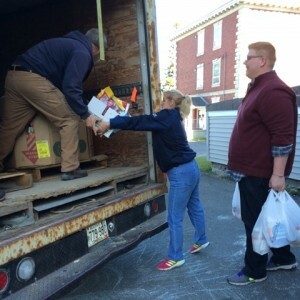 At UMPI, the Food Fight is being done as a campus-wide challenge, with an internal competition for the amount of non-perishable food donated happening between campus buildings in addition to the larger challenge with NMCC. At NMCC, Phi Theta Kappa (PTK), the international honor society for two-year colleges, is leading the charge by challenging the entire campus to contribute food items. Participants earn raffle tickets based on the amount of food donated. The winner of the raffle will receive a $50 Walmart gift card. All food donated from this competition will benefit Catholic Charities Maine. UMPI’s Houlton Higher Education Center also is participating in the competition from Sept. 29 through Oct. 9. Students from NMCC and UMPI who utilize the facility are encouraged to bring non-perishable food and dry-good items to the Center during their friendly competition. A “SNACK FEST” celebration will be held at the Center on Oct. 9, with a trophy awarded to the school with the most collected donations. All food donated from this competition will benefit St. Mary’s food pantry in Houlton. 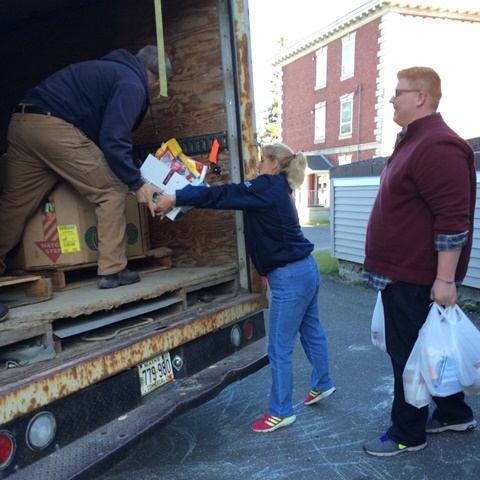 The idea for this unique food drive was hatched after UMPI’s Registrar Kathy Davis learned about the efforts underway in Maine to celebrate Hunger Action Month, a nationwide campaign—held during the month of September and organized by the Feeding America nationwide network of food banks—that mobilizes the public to take action on the issue of hunger. Wanting to “do something” to mark Hunger Action Month on the UMPI campus, Davis came up with the idea to challenge NMCC to a food drive, and then brought it to campus officials. Embracing the idea, a small committee came up with the “food fight” theme, NMCC officials were approached about the idea, and then both campuses took up the effort. At the end of the Food Fight, a truck from Catholic Charities Maine will pick up all the food donated by both campuses and officially weigh it to determine the winner. Officials hope to host a short presentation in early October to announce the winner and celebrate the efforts of both institutions. The winner will receive a trophy to display until next year’s event. To learn more about Hunger Action Month, visit www.feedingamerica.org/get-involved/hunger-action-month.aspx. To learn more about Hunger Action Month activities in Maine and some of the statistics, please go to http://www.ccmaine.org/a-z-services/foodbank and http://www.gsfb.org/.